Think through all the advice we’ve heard growing up. Even though we know we need to save, we’re not very good at keeping the green stuff from being spent. This matters even more when it comes to the example we’re setting for our kids. How do we teach our kids about financial responsibility when we are trying to figure it out ourselves? This one blogger’s come up with an idea we all can learn from. This not only works for kids, but for any adult who needs to save a little extra. The blogger behind Ben and Me breaks down her recommended plan, which in this case involves starting to save at age 15. The concept is simple — begin with $30/week, and continue increasing the savings amount by $3/week every year on his birthday. The idea is that after one year of saving weekly, another $3/week will not be that noticeable. Also, as he gets older, he will likely have the opportunity to earn more money. The biggest takeaway is not the amount of money, but the consistent action of saving money. Start small, then keep saving more and more each year. Even if you only start saving $5, you’ll thank yourself later for taking this advice. 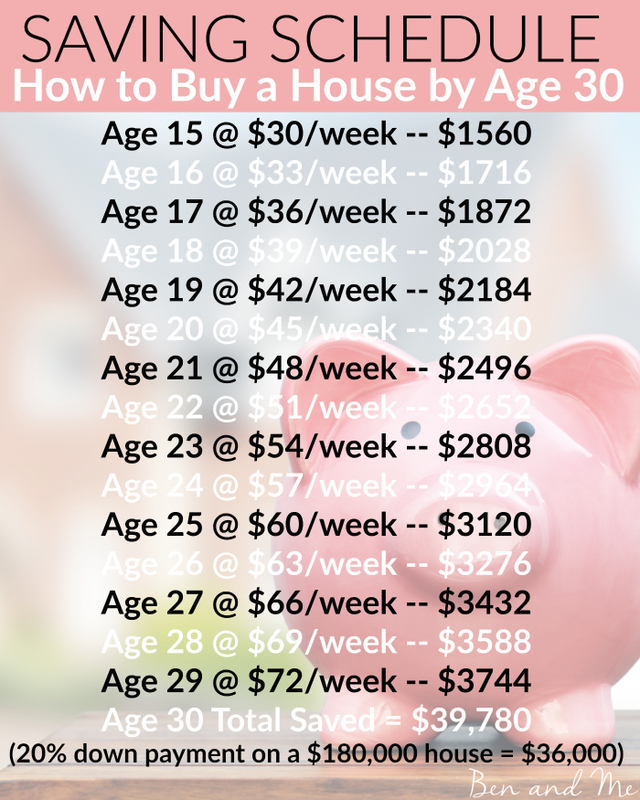 And it’s not like you (or your kids, if you’re helping them save) have to buy a house with the savings. Maybe they’ll look at the housing market and decide to wait. Maybe your kid really wants to go to a great college that costs more money than a house. Or maybe they want to start their own business with their savings, investing in their future. Maybe it’ll be the nest egg you’ve never had but always wanted in case of emergency. No matter the reason why you’re saving, it helps to have a roadmap to get you started. Start (or keep!) saving now to give your kids an example of good financial responsibility, and your actions will no doubt help them learn to save for themselves one day as well.